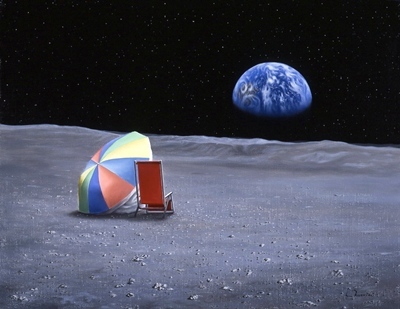 Just loven the Earth on a weekend, far from the rush and rumble of highways and automobiles. Take a lawn chair, spread a blanket in the shade, pack a picnic lunch, enjoy the beautiful scenery of nature. More than half of the worlds population now live in urban cities. Quite a shift from only a few decades ago when families still had ties to the land. The results of this dynamic migration is a disconnect with the environment and the eco-systems which keep everything in balance. Ask someone about the water cycle and where is their nearest watershed and you will get a blank stare. The cycle of plant growth that replenishes the air and the decomposition that nourishes the soil has little meaning when surrounded by asphalt and concrete. Familiarity with wildlife has been reduced to sighting a flock of pigeons or a few crumb begging sparrows. Encountering an insect or beetle will send most city dwellers into spasms of horror. There is a disconnect not only with nature but with the Earth itself. You turn on the faucet and water comes out – from somewhere, pour stuff down the drain or flush the toilet and it all just goes away – somewhere. The spread of the global economy and available mass media is helping to quash centuries old prejudices. People are learning that there are a lot of flavors to culture around the world and after all, we are the same species. That is a good thing. Then we ask who initiated these changes and who controls this new economy? Increasingly it is in the hands of a few corporate giants. Corporations have their own self serving ideas how the world should best be organized for profit and efficiency. Stand up straight, get in line, equidistant, categorized, pasteurized, homogenized. All natural resources are to be extracted and utilized, any dangerous byproduct is flushed, dumped or dispersed. Business’s profit from developing and selling a product, the byproduct is usually of little concern. Haul it away and dump the trash – somewhere. They say the apple doesn’t fall far from the tree. If we keep doing business the way we have it doesn’t bode well for the future of this planet – or as we contemplate human migration to other planets. Would you like to leave a gift for your grandchildren and their children? Would you like them to have kind memories of you? Of course you would. There is something that each and everyone of us can do. We can leave them a healthy and habitable planet. We can begin with lowering our consumption and reducing waste. Everyday choices about the products we purchase, the energy we use, re-purpose and reuse materials we already have, recycle, compost, grow your own food, share and donate to others. There is no need to sacrifice comfort and revert to a primitive existence by embracing a sustainable future. What is required is to re-think and reject practices that foul the air, pollute the water, poison the land and to redefine societies’ pursuit of indefinite growth in a closed system. Sustainable development can meet the needs of the present without compromising the ability of future generations to meet their own needs. The choice is ours and decisions need to be made now. 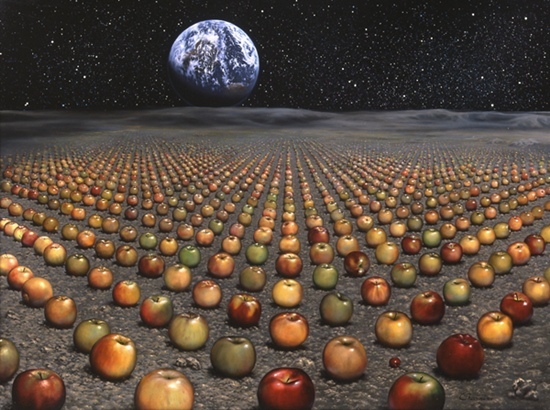 All paintings in this article are by Sami Charnine. 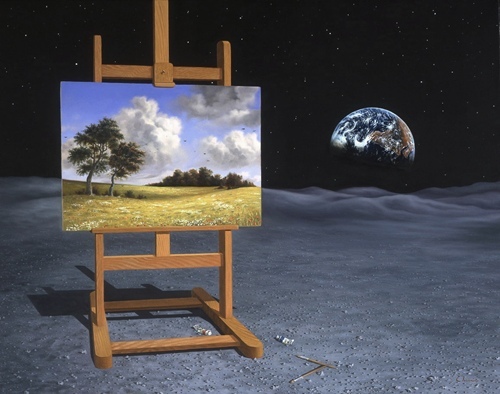 At first the iconic Earth Rise images captured my attention and a second later the magical cranial imagination kicked in and I was drawn to different reality, and so it was each time revisited. I recommend his full Surrealist collection which you can see here. 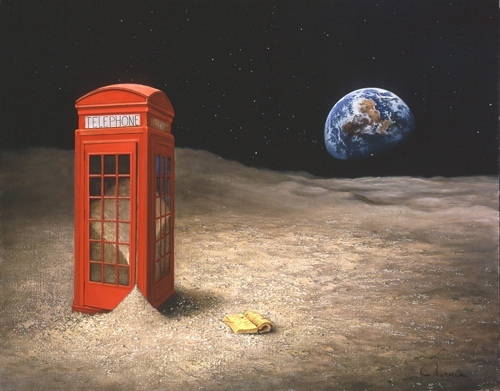 About the Artist…Born in Nice on the French Riviera, Samy Charnine immigrated to the United States in 1983. He lives a secluded life, devoted to his art. Impacted by the Masters as well as the Surrealists, Charnine combines whimsical images with classical precision in his execution. He grinds his own paint from historical pigments using recipes and techniques dating from the Renaissance. 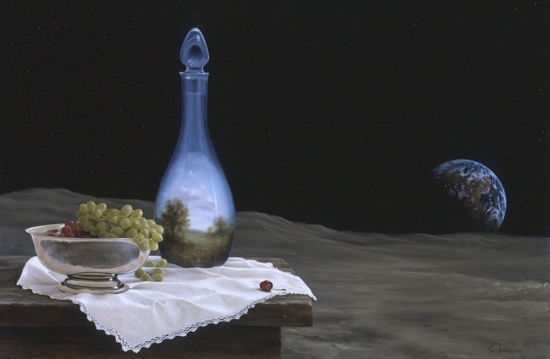 Charnine’s paintings are realistic in their detail yet with composition that evokes an emotional response from the viewer. He is collected by enthusiasts worldwide. 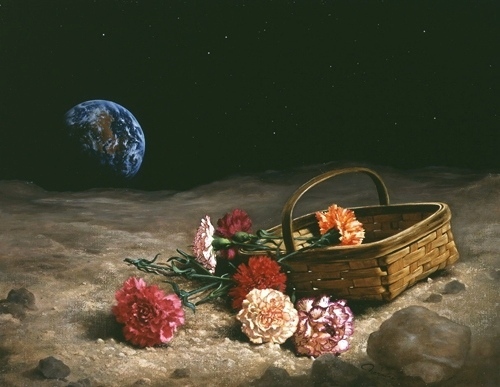 To view more of Sami Charnine’s paintings visit his web site – here. Earth day was founded 44 years ago in the United States. Since then it has spread to cities and countries around the world. Earth Day has created an awareness of the finite resources available on a fragile planet. It has led to laws and regulations that insure clean air and water, the protection of wildlife, preservation of wilderness areas and conservation of resources. Earth Day has spurred new studies of eco-systems, encouraged conversations between countries and development of new technologies. Great strides have been made in educating people about the interconnectedness of all species and natural systems in the environment. Much has been achieved but there is still much more to do to meet the challenges we face today and in the near future. The theme for Earth Day 2014 is Green Cities and you can find out more about participation, activities and history at the Earth Day Network. As our population grows we have to recognize that our consumption of the planet’s resources is unsustainable. We need a global transformation of attitude and practice. It is especially urgent to address how we generate the energy that drives our progress. Burning fossil fuels is the principal cause of climate change, which increasingly threatens prosperity and stability in all regions. That is why world leaders have pledged to reach a global legal climate agreement in 2015. This entry was posted in Air, Art, earth, environment and tagged Art, Earth, Earth Day, nature, Society, sustainable. Bookmark the permalink. and thanks back at ya Nil. Being able to help even one individual to change is a success albeit small. Refusing to purchase an unsafe product likewise won’t cripple a business but it is one dollar they will not have. One can only take the high road and help to educate others. Looking back over the years I see the tide is slowly turning. I’m in it for life as I believe you are Cathy. Mahalo. Wow, what a great artist, glad to have seen his work in such a great context. Thanks for raising your voice and speaking out. At times it is easy to feel so frustrated and powerless, and I have noticed this among friends recently who feel like their consumer choices and signing of petitions etc are useless in the end… but we DO have some power and must remember that.